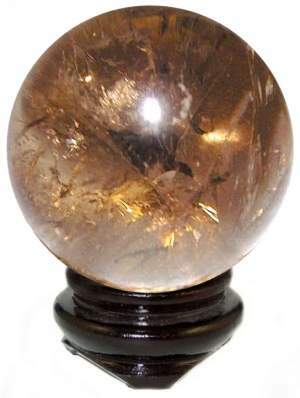 Good color, nice clarity Smoky Quartz Crystal Sphere/Ball from Brazil are mostly clear with some inclusions which reflect amazing rainbow lights. Smoky Quartz has a gentle yet intense clearing quality that penetrates and dissolves habitual negative thoughts and feelings which poison daily life. A lovely sphere for your collection, which shows up very well when lighted. Good polish and finish with no cracks. The Walnut Finish Oriental Stand included. Smoky Quartz has a gentle yet intense clearing quality that penetrates and dissolves habitual negative thoughts and feelings which poisons daily life by prolonging anger and resentment. This stone provides an excellent grounding quality that helps clear emotional blockages and assist in achieving cooperation with others. It can assist in reaching a healing meditative state which can lead to a higher spiritual development.